Classic 4/4 viola, exquisite workmanship, with rich and powerful tone. High-quality spruce wood body with vintage style and smooth surface. Rosewood fretboard, basswood chin rest and aluminum alloy tailpiece. Including a nice padded viola carry case for convenient storage and transport. 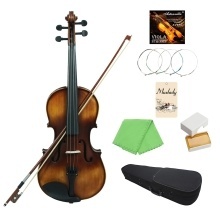 Comes with an extra full set strings, a rosin and a cleaning cloth(random color delivery).